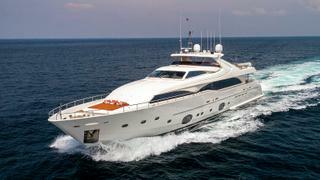 The 34.2 metre motor yacht Happy Days, listed for sale by Y.CO, has had a price reduction of €1,000,000. Built in GRP by Italian yard CRN to a design by Zuccon International Project, Happy Days was delivered in 2013 as one of the Ferretti Custom Line 112 Next series. A stylish interior in fine Italian woods, fabrics and leathers accommodates up to 14 guests in five cabins comprising a master suite and VIP suite with sofa beds, a further VIP suite and two twins, each with Pullman berths. An additional three cabins sleep six crewmembers aboard this yacht for sale. The 45 square metre main saloon has comfortable furniture, large windows for panoramic views and an entertainment centre including a large screen television. The expansive sun deck offers all the amenities for guests to enjoy al fresco cocktails and meals, with a spa pool, bar, semi-shaded dining table and sun pads. Her impressive stern garage houses a 4.2 metre tender, custom dive centre with six sets of scuba diving gear, and a variety of water toys. Twin 2,800hp MTU engines allow a cruising speed of 23 knots topping out at 27 knots and she is fitted with hydraulic fin zero speed stabilisers. Lying in Phuket, Thailand, Happy Days is now asking €5,900,000.